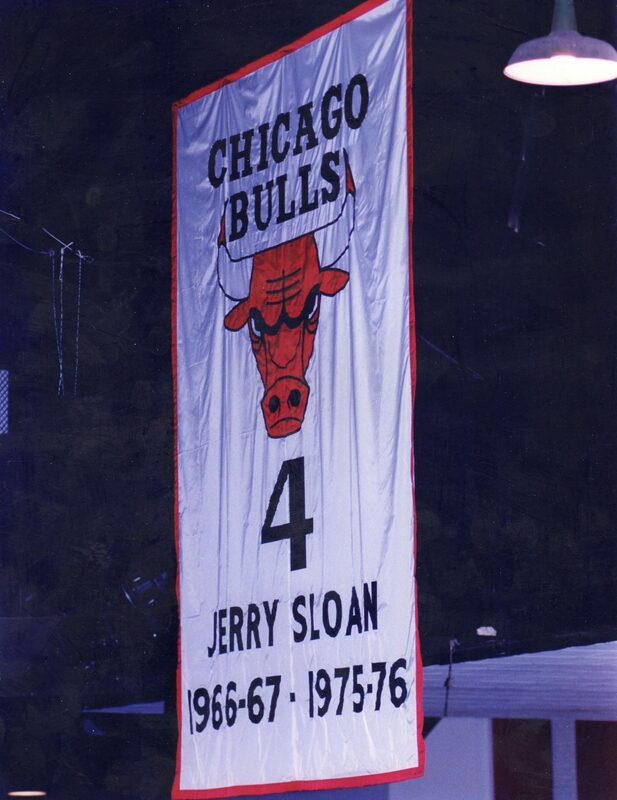 Jerry Sloan was the original Mr. Bull long before Michael Jordan came along, and for many years his No. 4 jersey was the only one hanging high above in the rafters of the old Chicago Stadium. Born March 28, 1942, Gerald Eugene Sloan, a native son of downstate Gobbler’s Knob, Illinois, is the youngest of 10 children raised on a family farm. His father died when he was just 4 years old, so for most of his childhood he grew up in a single-parent home, raised by his mother and brothers and sisters. He did farm chores every morning starting at 4:30 a.m., and then hoofed it almost two miles to school for 7 a.m. basketball practice. He ended up being an All-State basketball player at nearby McLeansboro High School, and upon graduating briefly attended the University of Illinois. However after arriving on campus, he immediately felt out of place, and quickly dropped out, heading back home to help out on the farm. The following year, at the strong urging of his family and girlfriend, he decided to give college another try, enrolling at the University of Evansville, a nearby Division II school just across the Illinois/Indiana border. Jerry Sloan’s jersey retirement ceremony in 1978. Standing 6’5” and weighing 195 pounds, Jerry Sloan was always the biggest player on the Purple Aces. He played a couple of years of varsity basketball and over that stretch averaged a combined 15.7 points and 13.1 rebounds in helping Evansville win to back-to-back NCAA Division II National Championships. Sloan’s hardnosed style of play drew the attention of the NBA’s Baltimore Bullets who selected him in the third round as an eligible junior in 1964. However, Jerry wasn’t ready to leave school just yet, so instead of jumping to the pros he returned to Evansville to complete his degree and play one more year. That decision ended up working out great as the Purple Aces went undefeated and captured a second straight National Championship. The Bullets were the incarnation of the onetime Chicago Packers/Zephyrs, who in just two years of existence packed up and left the Windy City for Baltimore after being sold to new owners. 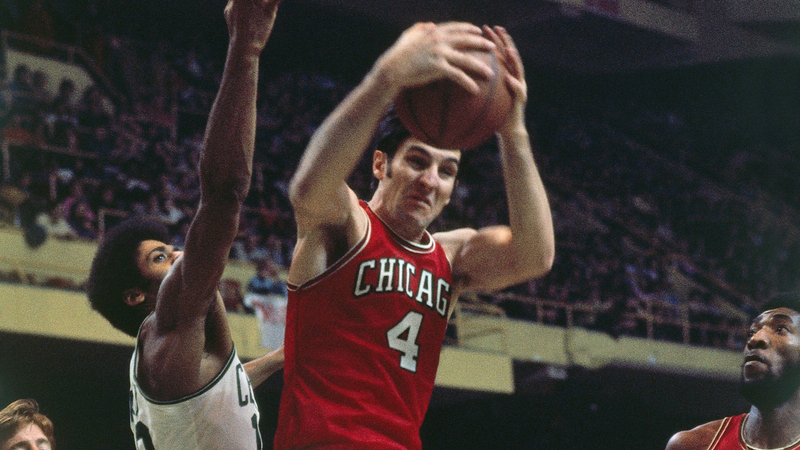 The Bullets never lost interest in Sloan, thus they used the sixth overall pick in the first round of the 1965 NBA Draft to reclaim his rights. This time the 23-year farm boy was only too happy to give pro basketball a go and so he headed straight to Charm City to begin a new adventure. That rookie season not only introduced Jerry to the ways of the world, but it also introduced him to the one and only Johnny “Red” Kerr, a fun-loving Chicagoan who was playing his final season of a highly successful career with Baltimore after 11 with the Syracuse Nationals/Philadelphia 76ers. 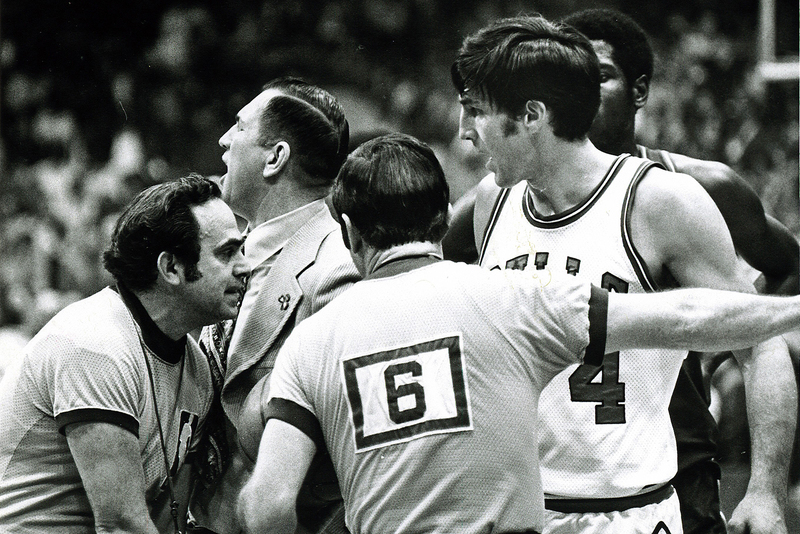 Jerry Sloan on court during the 1973-1974 NBA season. Kerr was so impressed with Sloan’s unbending work ethic that upon retiring at the end of that season and being named the first Head Coach of the NBA’s latest expansion team — the Chicago Bulls — a couple of weeks later, he knew exactly who he wanted to lead his team onto the court: Jerry Sloan. 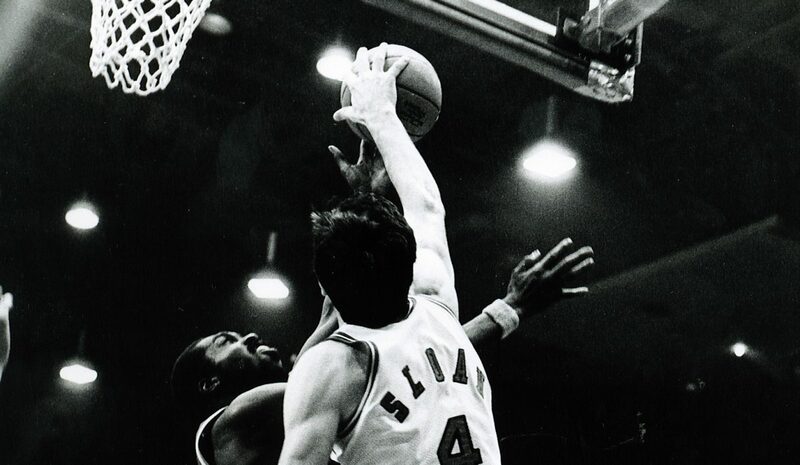 Jerry Sloan grabbing a rebound against the Boston Celtics. That first year Sloan teamed with veteran point guard Guy Rodgers in the Bulls backcourt, and together they helped guide Chicago to an unheard of 33 wins and a playoff berth. 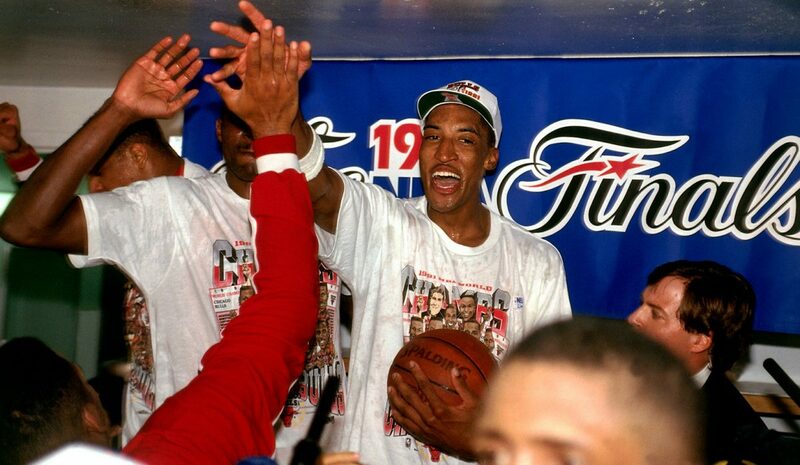 Jerry averaged 17.4 points and a career-best 9.1 rebounds and was named an All-Star for the first time. Although Kerr didn’t last past a second season as Chicago’s head coach, Sloan established himself as a mainstay, developing a reputation around the league as one of the toughest players to ever lace up a pair of gym shoes. He was never shy when it came to mixing it up, be it crashing the boards for a rebound or stepping in the lane to draw a charge. Bolstered by the acquisition of Norm Van Lier to run the point by the start of the 1971-72 season, Chicago suddenly boasted the grittiest defensive backcourt in the game. 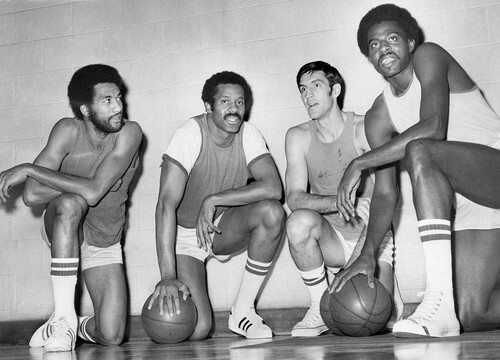 The 1972-73 Chicago Bulls with Norm Van Lier, Chet Walker and Jerry Sloan and Bob Love. While Van Lier was amassing eight straight NBA All-Defensive honors, Sloan was garnering plenty of recognition of his own, as a two-time NBA All-Star and six-time All-Defensive team member. That willingness to go all out led to success. 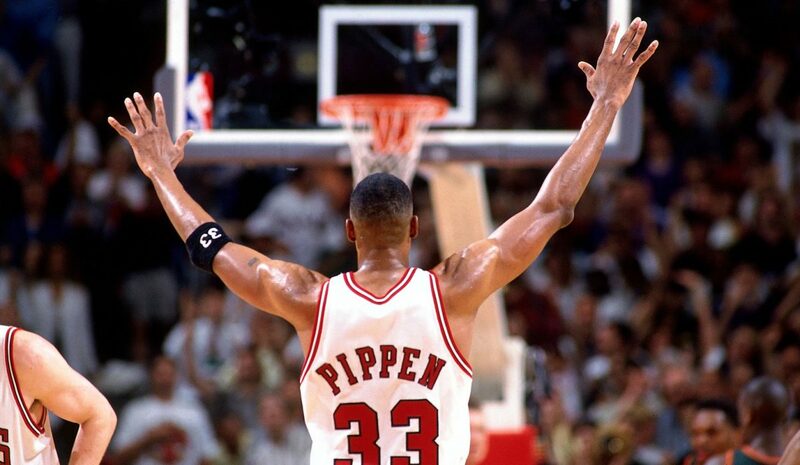 In Sloan’s ten full seasons as a player, he made the playoffs nine times (eight in Chicago). 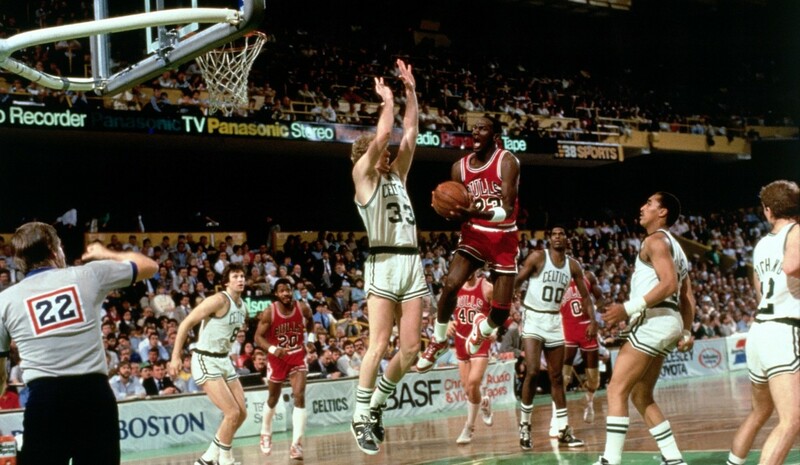 And while the Bulls were often vanquished in the playoffs by the more talented Los Angeles Lakers or Milwaukee Bucks during his era, the team’s hardscrabble personality embodied by Sloan and Van Lier solidified Chicago as a legitimate NBA city. Sloan’s career numbers ended up at 14 points and 7.4 rebounds over 755 games. And while the NBA only started keeping track of steals eight years after he began playing in the league, his career 2.2 steals per game average is still one of the all-time best marks in NBA history. 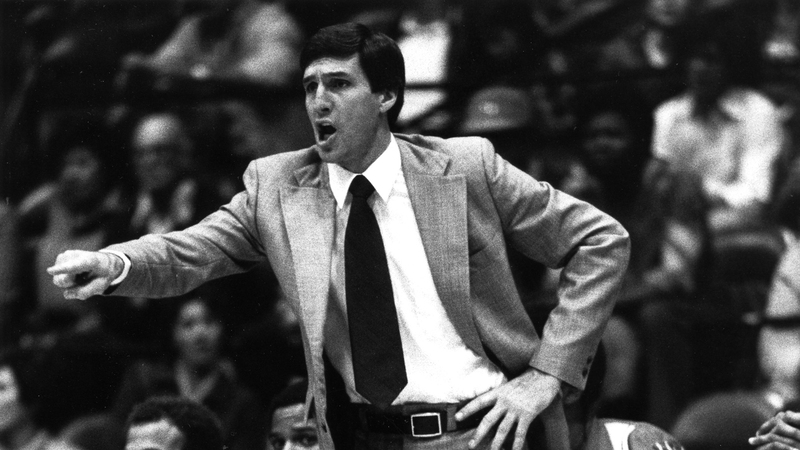 Jerry Sloan as Bulls coach during the 1979-1980 season. A serious knee injury in 1975 cut short Sloan’s playing career at the age of 33, hastening the collapse of the first great Bulls era. A couple of years later he jumped into coaching, first as an assistant (1977-78) with the Bulls, and a little over a year later as the team’s head coach. After leading Chicago to the playoffs in his second season at the helm, the Bulls got off to rocky start the following year, and after 51 games management decided he needed to be let go. In less than three years as the Bulls’ head coach, Chicago had gone 94-121 (.437). Sloan returned to the NBA a year and half or so later, first accepting an offer to be a scout and then an assistant under Frank Layden of the Utah Jazz. When Layden was promoted to team president 15 games into the 1988-89 season, he named Sloan as the Jazz’s new head coach—a job Jerry held onto for the next 23 seasons. Sloan lead the Jazz to seven division titles and 13 seasons of 50 or more wins (only Hall of Fame coaches Pat Riley and Phil Jackson had achieved such an incredible feat prior). He also directed the Jazz to the playoffs 19 times as well as two consecutive NBA Finals (1997 and 1998), losing both to the Michael Jordan/Scottie Pippen-led Bulls. In 2006 he became the fifth coach in NBA history to record 1,000 wins when the Jazz defeated the Dallas Mavericks, 101-79, on December 11th. He currently ranks first on the all-time list for consecutive games coached with one franchise (1,809), and also owns the record for most wins with one team (1,124). 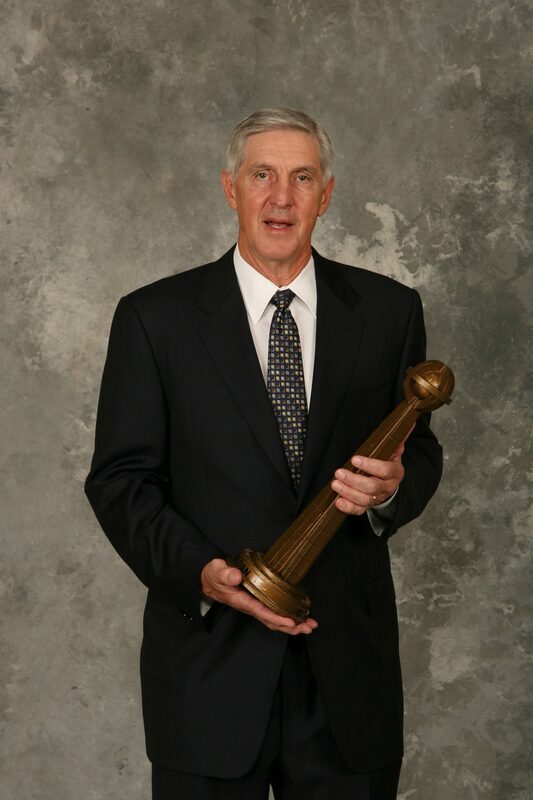 Jerry Sloan’s Hall of Fame induction. Jerry married his high school sweetheart, Bobbye Irvin, in 1963 and together they had three kids, two daughters Kathy and Holly, and a son, Brian. They were married for 41 years before Bobbye passed away from pancreatic cancer in 2004. Jerry got remarried in 2006 to Tammy Jessop, and has a stepson, Rhett, as a result. In April 2009, he was elected to the Naismith Memorial Basketball Hall of Fame, in the same class as his longtime former Utah Jazz point guard John Stockton, and fellow Chicago Bulls franchise icon Michael Jordan.